No bloodthirsty samurai or touched-in-the-head military commanders this week, just two pairs of hunters pursuing their prey. In Nihei Tetsuzou Tanigaki finds someone who both respects and can relate to his Matagi heritage. When it comes to hunting, he knows his stuff. Nihei’s also a rude old man obsessed with boners, and nothing makes him more erect than the prospect of killing the one remaining wolf in Japan, considering how clever such a wolf would have to be to escape extinction thus far. 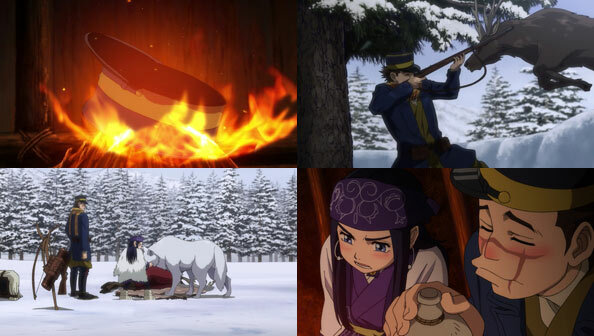 Meanwhile, in those same mountains, Sugimoto and Asirpa continue to track the buck he wounded, but the damn thing manages to have the speed and stamina to force them to give up for the day and seek refuge in a felled tree. 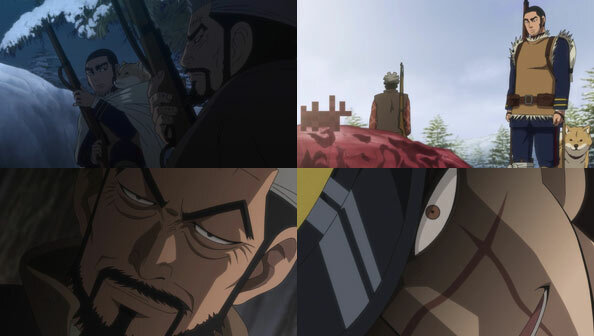 While dining on Nihei’s bear delicacies, Tanigaki decides to toss his cap in the flames, abandoning his military life. While returning home may be difficult, showing up with the head and pelt of a great white wolf will certainly help matters. Elsewhere, Sugimoto is in perfect position to kill the buck, but freezes when he sees the bloodcicle sticking out of its rump, and sees himself: an immortal beast doing everything it can to stay alive. Sugimoto woke up that morning from a PTSD nightmare, but can help but see his own indomitable spirit staring back at him. Thankfully, Retar is around to bring the buck down once and for all. Asirpa cuts it open and has Sugimoto place his freezing hands inside its still-steaming warm body. It’s heat is becoming his heat, and when they feast upon its brains and other parts (and wash it down with sake) its death sustains their life. Nihei and Tanigaki stake out the buck carcess, believing the white wolf will return for the meat, but the next morning they only find its droppings, which Nihei burns to further anger the beast. 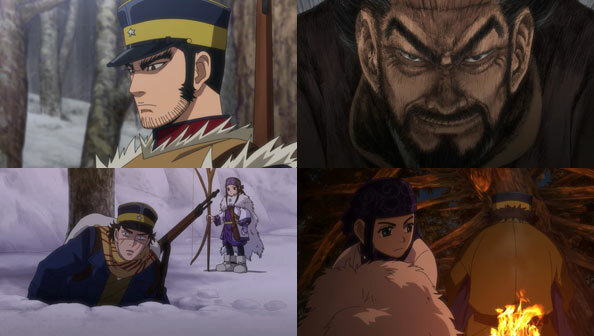 He gets tantalizingly close to putting a bullet in Retar’s brain, but this time Asirpa and Sugimoto have the wolf’s back, startling it off with an arrow. With that, Sugimoto the Immortal comes face to face with Nihei, who wishes to become part of the mountains, but only when he’s good and goddamn ready, meaning he’ll put up a hell of a fight before he surrenders his tattoos, especially since his wolf hunt was interrupted. Ichiko takes in an abandoned kitten and names it Fluffy, but she dwells on Momoji’s warning about her hurting those close to her. Ibuki, the toilet god appears, but when he mentions misfortune, she flushes him out of hand. The next day Momijij kidnaps her cat, which she originally planted. Ichiko summons her demon friends, but Momiji uses a “Dayson” to vacuum them up, along with a good amount of her fortune. The gym they met in catches fire. Ibuki arrives to save Fluffy, but accidentally turns her into a Beckoning Cat god which leads Ichiko to safety. Ibuki gives Momiji a necklace with a “keystone” which will prevent her from draining others’ fortune. Instead, Momiji takes the long road: planting a cat, hiring Ibuki to go in the house and introduce himself; kidnapping the cat; challenging Ichiko to a duel; foilng her with her latest gadget (which resembles a real Dyson); etc. When Ichiko is trapped in a burning gym, Momiji realizes she may have gone too far, and fortune ends up finding Ichiko in the form of a mistake by Ibuki that turns Fluffy into a friggin’ god. In any case, Ichiko will no longer be draining anyone’s fortune – which seems to go a long way towards Momiji accomplishing her mission of neutralizing that threat.